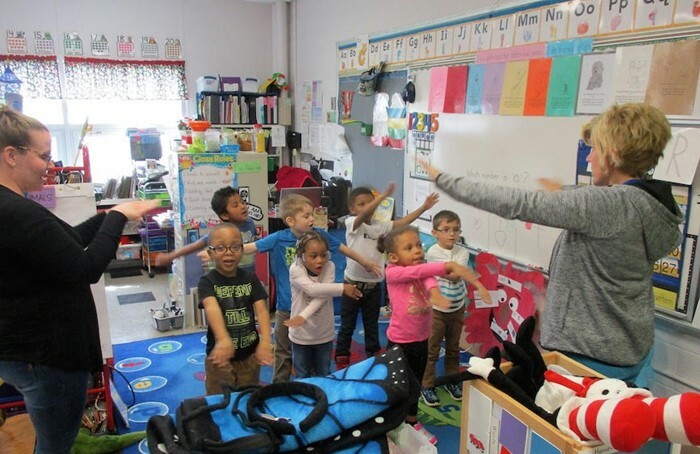 Teacher Kim Wendt, right, leads pre-kindergarten students in an exercise song before starting classwork. Mansfield City Schools’ award-winning pre-kindergarten program is accepting enrollment applications for the 2019-2020 school year. The program, located in the Springmill STEM Elementary School at 1200 Nestor Dr., offers quality educational experiences to children who will be 3, 4, or 5 years old by Aug. 1. Six classrooms are staffed by licensed, highly trained teachers and paraprofessionals. Enrollment is open for both the morning session, 8:30-11:30 a.m., or the afternoon session, 12:30-3 p.m. Children will have either breakfast or lunch. Transportation to and from Springmill is provided. Tuition is $100 per month with a sliding fee schedule for families who qualify. Children with an Individualized Education Plan (IEP) are not charged tuition. The child-centered curriculum meets the needs of the whole child – cognitive, social, emotional and physical – and is aligned with Ohio’s Early Learning Content Standards. Mansfield City Schools’ pre-kindergarten program has earned a 5-Star Quality Rating from the Ohio Department of Education and the Ohio Department of Job and Family Services. This highest-possible rating was awarded for the program’s compliance with Step Up to Quality, a rating system which recognizes programs that meet quality benchmarks over and above minimum health, safety and educational licensing standards. Complete information and an online registration form are available online by going to tygerpride.com and scrolling down to MCS pre-kindergarten under “schools” at the top of the page.